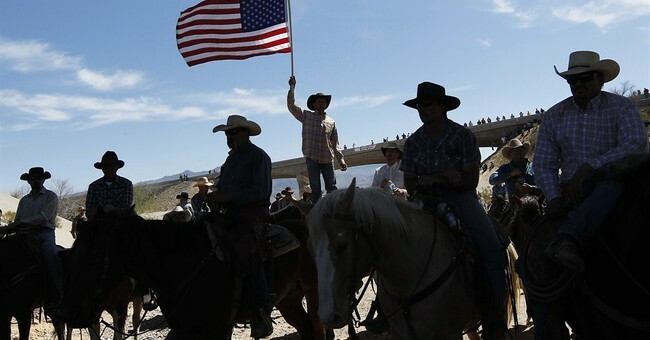 I love that picture from the Bundy Ranch. You know the one that I’m talking about: I’m talking about all of them. I love the horn-handed Cowboys, with real, honest trail dirt on them; I love the American flags; I love the sagebrush; and I love the rebellion-- as in civil, non-violent disobedience. And the question now is, where does this go? Rebellion typically starts after a period of lassitude and hopelessness in the face of overwhelming power. Populations spend years, even decades muttering under their breath about abuses of power, but feel ineffectual to enact real reform. Then one bright day, a fruit stand merchant, or a cattle rancher—to name two recent examples—makes a stand. And the reaction is immediate and powerful, with outraged citizen rallying around the cause. The central power then either lacks sufficient will or sufficient strength to accomplish their goal. Usually, the idea of resistance is so foreign to their conception of reality that it’s difficult for them to even contemplate the grievances on the other side. But they know bad publicity when they see it; and the rather weak shoulders of the typical bureaucrat then take over. They start to worry about CYA; covering their own assets. They worry about their pension, they worry about whether the politicos in charge of policy will hang them out to dry; they worry about what the neighbors will think. And they worry about seeing their name in the newspapers. While Obama and Reid and Pelosi are immune from consequences and criticism, the rank-and-file $300 a day bureaucrat is the first to have to fall on his sword if things go wrong. An oppressive bureaucracy needs a ton of paper pushers like these, even some armed with guns, to keep the oppressive scheme going. As we are seeing at the IRS, where illegal campaign activity as well as political targeting of conservatives has been well documented, these wee people, with small jobs and mini-fiefdoms typically operate in the anonymity of a sea of federal gray-area. At the IRS, the SEC, the Federal Reserve, the Treasury Department, the Park Service and an ad nauseam list of federal agencies, anonymous people, make anonymous decisions in the domestic war of terror that the federal government uses to keep us all in line. So the key in these situations is not to shout “Down with Obama” in front of the White House, but rather to go after the paper pushers who crave the anonymous power that comes with being a federal bureaucrat these days. These are the enablers, these are the ones with sufficient knowledge but often with insufficient moral fiber, to stand up and say what really happened under Lois Lerner at the IRS. These are the ones at Health and Human Services who know exactly what happened with the $300 million dollars spent on the Obamacare website that still doesn’t work. These are the ones who know what the green energy loan program was all about. And we should be talking to these people. Citizens should be targeting these people, asking them to stand up and do their real job, which is to serve and protect the citizens who pay their salaries. There are snivelers and tyrants amongst the bureaucrats who enjoy the fresh air and bright sunshine that anonymity gives them. We should make it rain on them, hard. There are patriots amongst the bureaucrats too, and they must know from us that we will protect them, encourage them and reward them. We have to make it make it clear to the bureaucrats that there are only two sides in the war the federal government is waging upon the rest of us. There is the right and there is the wrong. And it’s no longer sufficient to say you’re just following orders. Orders from whom? I want to know; from whom?